There was a famous American author who was deaf, blind, her name was Helen Keller. She said this, “the best and most beautiful things in the world cannot be seen or even touched. They must be felt with the heart.” It is true, the really beautiful things in life. You don’t see them with your eyes. You have to feel it with your heart. That’s why people close their eyes when they enjoy the beautiful things, they want to taste it rather than seeing it. I think our faith is like that too. Faith is not to accept what you see. Faith is to accept what you don’t see. You believe and see. Not that we see and believe the order is the other way. The first belief, and then we’ll be able to see it. Once Thomas doubted about Jesus’ resurrection and this is what he said, “unless I see the mark of the nails in his hands and put my finger in the mark of the nails and my hand in this in his side, I will not believe.” He demanded to see before he believed and Jesus said to Thomas, have you believed because you have seen me, blessed are those who have not seen and yet have come to believe. Faith is not to believe what you see, but what you cannot see. That’s why the Hebrew writer defined faith in this way. Now faith is the assurance of things hoped for, the conviction of things not seen. Faith is the conviction of things not seen with eyes of faith, we accept what we cannot see. St Paul confessing this way. “We look not at what can be seen, but at what cannot be seen.” I mean these great people are so different from us. St Paul and all, Helen Keller, all these people, they were able to see what cannot be seen? What ordinary people cannot see, these people were able to see. The beauty of being able to see what you cannot see is that you find treasure in life. I mean what we see in the world in our life is only 10 percent. Ninety percent of the life that we are experiencing is what we cannot see. But you feel only if you live only seeing what you can see you’re living only 10 percent, but when you’re able to see what you cannot see it, you can find the treasure. You can find the beauty in life because beauty is hidden in what we cannot see. For example, our outer nature, no matter how beautiful you are, you may be, as you get older, a belly comes out and a hair gets grey and then you get wrinkles. Your outer self is naturally wasting away, no matter how much I try, so I don’t like to get taken pictures anymore. So I run away whatever people put the camera on me, I run away because when I look at the mirror, sometimes it’s okay, but when I look at the picture, it comes out exactly as it is. That’s why I don’t want to see. So our outer nature, you can see so clearly that you’re wasting away. You’re being wasted away. Every year is different. When you get to near 60, you will experience that when you’re in 20’s is okay, 20 or 23 years, still beautiful. But when you become 60, 61, 60 something, make so much difference. But. But it’s important. But St Paul saw the inner self. Inner self is what you cannot see. Your inner self is being renewed day by day. He saw that. He saw what cannot be seen. He saw the inner self-being renewed day by day. And also the house that you built on this earth. No matter how beautiful you may’ve designed, after 10, 20, 50 years, it becomes decayed and destroyed. St Paul saw that, but the when the earthly tent is destroyed, he saw what cannot be seen. That is the home in heaven that you can never destroy. That home, that house, not built with human hands, but built by God will never be destroyed. That’s why Saint Paul said, I don’t lose heart even though my outer nature is being wasted away and even the earthly tent is being destroyed. I don’t lose my heart because I have an inner self. And also I have a home that is eternal in heaven. If he looks at only what we can see, we’ll lose heart. But when we see what we cannot see, we can get confidence. Last week was particularly difficult for me because one of my friends actually he was very close to me. Lee Soo Chul jundosanim. He was not just jundosanim. He is my golf buddy and he’s a wonderful man, so we spend a lot of time together, we share a lot of things together. His wife had a heart condition, so he was always concerned about his wife’s health. So, he always went home and made sure that she was okay and her a heart, she had a heart attack about 30, 35 years ago when she was giving birth. So she always, all her life, she lived with a heart condition and all of a sudden, last week, she couldn’t handle that anymore. She has three heart attacks that morning. And then when I by the time I visited her, she wasn’t conscious. She wasn’t able to survive. I had a really difficult time, doing the funeral, you know, whenever we had, you know, the staff, she really took care of us very well. She was a good cook and she always made new food and let us taste it and enjoy it and all that. And so, I miss her terribly, but his family came from Chicago to attend a funeral and his sisters also came and then his younger sister somehow got very stressed and she passed away yesterday. And so I went to hospital and I did the final rite. Then they have to send that a body to Chicago and then they will have a funeral here and there and before he can even a grief for his own, wife. Now he has to get to Chicago to grieve for her, his sister’s death. I mean, how can you handle that? How can you handle that kind of a tragedy, the tragedy in your life? How can you survive? Yesterday, I went to the hospital and then he held my hand and then he said, “thank you, thank you for being with me. And thank you for doing the final rite for my sister.” And he said, “I’m out of my mind right now. I can’t think.” But with tears, he really thanked me. Where did he have room to thank other people. That thankfulness is faith. That thankfulness. This morning when I arrived at, at a church, he was there waiting in the parking lot for me before he left for Chicago. He came to tell me, “thank you.” What a great person. I mean he came all the way from Scarborough just to see me, to thank me. IT’s like the 10 lepers getting healed and one came back and thanked Jesus. The same way. If he lives with only what he can see, he’ll lose heart. But, he was able to see what cannot be seen. That’s why you didn’t lose heart. The Cross, we can see. The suffering, we can see. But the resurrection, we cannot see. The glory. We cannot see. In this life, we not only see suffering, but we also see glory. We not only see the cross, but we also see the resurrection. People with great minds and great heart, they live seeing what cannot be seen. That’s how they live. When their situation is totally helpless and hopeless and they cannot see anything hopeful they saw hope which cannot be seen. They saw treasure hidden in the field when most people cannot even see that there’s a treasure in the field, but they see the treasure in the field and they sell everything that they have and then they buy the field. Sometimes in life, like jundosanim, we look around, we cannot really see what’s ahead of us. It’s like a foggy road, you don’t see an inch, but you have to move on, but you cannot see anything because suffering is so much. The pain is so much. The sorrow and sadness, that is so much that you cannot see anything beyond an inch. That was the experience of Job. This is what Job said. “If I go forward, he’s not there or backward. I cannot perceive him. On the left, he hides. I can not behold him. I turned to the right, but I cannot see him. Forward, backwards, right or left. He could not see anything. But Job said. But. This but is important. Right after he said that: “I cannot see everything” he said, “but he knows the way that I take. When he has tested me, I shall come out like gold.” What a confession. What a great mind. What a great person. That’s a greatness of Job. Because of suffering, he cannot see anything but God sees me. I can not see God, but God can see me. That’s what he knew. That’s hope that we have. I cannot see God, but God can see me. There’s a fire in the house. Everybody rushed out and then the father and the mother, they all rushed out, run, run, run. They all came out and the father thought that everybody came out and then he looked up and there was a son in the second floor at the window. And the father said jump and the son said. “Dad. I cannot jump because I cannot see you” and the father said, “but I can see you.” But I can see you. That’s where the hope is. 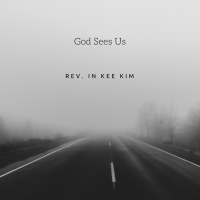 We cannot see God, but God can see us. When we are suffering so much that we can not see anything ahead of us, but God can see you. And God will bring you out. My friends, what can be seen is temporal, temporary, but what cannot be seen is eternal. Hold onto what’s eternal. Don’t hold onto things that are here for awhile and vanish, but hold onto things that are eternal. When you cannot see anything, still you gotta move on because God sees you. This is what Martin Luther King Junior said in his sermon. “Fly as high as possible. If you cannot fly, run. If you cannot run, walk. If you cannot walk, crawl, but don’t ever sit down and give up. Move on. Don’t ever stop your journey.” We gotta move on even though we cannot see anything in life.